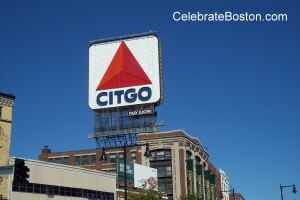 The current beacon on Beacon Street is the giant Citgo Sign. It has been a Boston landmark since 1940. The sign had originally said Cities Service, and was changed to the new logo in 1965 (with nearly 6,000 neon bulbs added). The sign is visible from great distances on both sides of the Charles River, especially as one approaches the city from the west. During the oil crisis of 1973, the sign's many blinking neon bulbs were turned off to conserve power. They were again shut off from 1979 to 1982 for the same reason. The Charles River was actually darkened when illumination from reflecting light of the sign was extinguished. In 1982, the Citgo Company planned to dismantle the sign, and a populist campaign was mounted to preserve it as a symbol of Roadside Americana. In 1983, the Citgo Company paid $450,000 to refurbish the sign, and since then the light from this beacon has once again lit up Boston's Back Bay District. In the mid-1970s, it was debated whether the sign was an eyesore and should be removed. One letter to the Boston Globe stated, it's Boston's "North Star." Other people remarked how driving was crazy in Boston, and one could always find Kenmore Square due to the sign, especially at night. The sign is 60 feet by 60 feet and had contained 5,878 neon lights (replaced in 2005 by an LED array). Runners in the Boston Marathon each year are motivated when the sign becomes visible late in the race. The sign is also displayed on millions of TV sets when baseball sluggers hit a homerun over the left field wall at Fenway Park. For those politically offended by this sign because it is owned by a foreign company, please remember that a weak dollar causes foreign ownership. Massive federal deficits always devalue the dollar, so whatever political party is in power here should remember the huge impact of deficit spending. Low interest rates set by the Federal Reserve also greatly devalues the dollar. Landmarks of Boston's past and present include the Boston Stone, Liberty Stump, Plywood Palace, Lollipop Building, and the Pregnant Building.